HERCULES WORKSHOP RECONDITIONS AND REPAIRS VINTAGE TYPEWRITERS AND CALCULATORS (SPECIALIZING IN IBM SELECTRIC TYPEWRITERS). 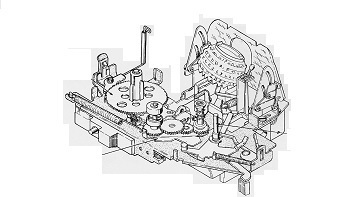 WE SERVICE MOST MODEL MANUAL, ELECTRIC AND ELECTRONIC VINTAGE TYPEWRITERS AND CALCULATORS. We repair IBM Selectric typewriters. Repairs to these machines can require a technician with specialized skills and we've got that covered. Service work performed by professional technician with over 40 years experience, specialized on IBM selectric typewriters. We repair most models of manual, electric and electronic vintage typewriters (Brother, Facit, Olivetti, Olympia AEG, IBM, Royal, Smith Corona and Underwood). General repairs and service. We carry in stock a good range of original replacement parts. All repair work includes shop cleaning. General repairs and cleaning of manual (mechanical), electric and electronic vintage calculators. If we can't fix then you don't pay. A lot of these vintage calculators used odd ball power cords. Have you lost the power cord for your vintage calculator? We also do electrical plug conversions so you can use a standard power cable with your machine. The oils and grease used in typewriters attract dust and other foreign material over time. They can accumulate on the latches, escapement, gears and other mechanisms affecting their operation. We do complete cleanings and re-lubrication. We recondition IBM Selectric typewriter case assemblies (721, 723, 725). New paint, noise insulation foam, grounding strap, reconditioned hinges, locking latches. Mounting hardware and grill vent. 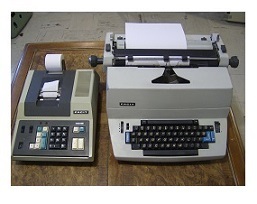 Red - IBM Selectric Typewriter (725) and Black - IBM Selectric Typewriter (721). Have a Machine You Want Serviced? Turn around time on repairs is usually 2-3 weeks depending on our repair backlog. If we can't fix your machine or fix it within the quoted repair cost then we'll contact you before proceeding any further. Repair costs do not include return shipping or insurance. All repair work is warrantied against defects in both materials and workmanship. It's usually best to contact us before shipping items to us for repair, just so we'll be expecting them. You can either call us or write to us at the above email box. We recommend shipping insured parcel post. Pack your item carefully in its original box. If the box is not available, use a strong carton with plenty of newspaper or other padding. Enclose a brief note telling us the specific problem you are having with the unit and your name and address. Remove any batteries.